A belt buckle frames the entrance to the new Gilley's in the Choctaw Casino Resort in Durant. Gilley’s, the iconic Texas honky tonk that was featured in the 1980 movie “Urban Cowboy,” has crossed the Red River into Oklahoma. Yep, the cowboy hot spot is now open in the Choctaw Casino Resort in Durant. One of only three Gilley’s in the United States, Gilley’s at Choctaw is in the space previously occupied by the Diamondback Lounge. Gilley’s offers a full-service restaurant and night club with 176 seats, two bars with a draught beer system offering up to eight different beers on tap, a dance floor and, of course, a mechanical bull like the one seen in the movie starring John Travolta. Playing off the movie, Gilley’s offers a 32-ounce man-sized beer called Bud and a 16-ounce beer named Sissy. What’s more, there’s a 500-square-foot performance stage smack in the center of the venue offering 360-degree views. That makes for great people watching — on the dance floor and off. But two-stepping isn’t the only action going on here. With 15 high-definition LCD televisions and one eight-foot projector screen, Gilley’s promises to be a great place to watch televised sports. Think Bedlam football with OSU versus OU. 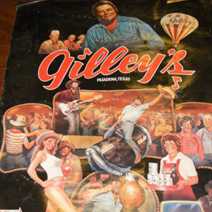 The original Gilley’s, founded by country singer Mickey Gilley in Pasadena, Texas, burned in 1989. The brand was acquired by a developer who opened Gilley’s in Dallas in 2003. Choctaw Casino Resort is at 4216 S Highway 69/75 in Durant. For more information, call (888) OK CHOCTAW.